Common seals are also known as Harbour Seals and are found along temperate and arctic marine coastlines in the northern hemisphere. They can be found in the coastal waters of the Northern Atlantic and Pacific Oceans but also in the Baltic and North Seas. They generally stick to rocky areas where land predators can't reach them so easily, and there is a steady supply of fish. They have a fatty tissue called 'blubber' which keeps them warm. Seal hunting which was once common practice is now mostly illegal. 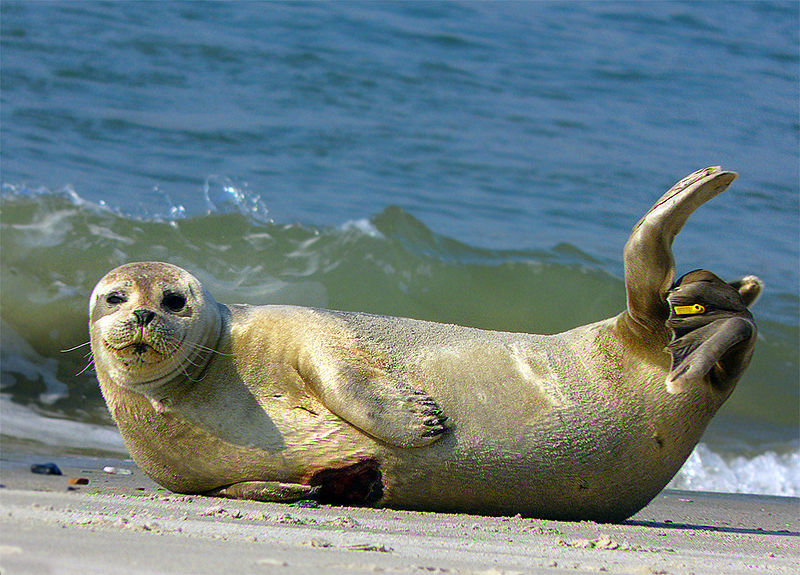 Western Atlantic Harbor Seal in Eastern North America. 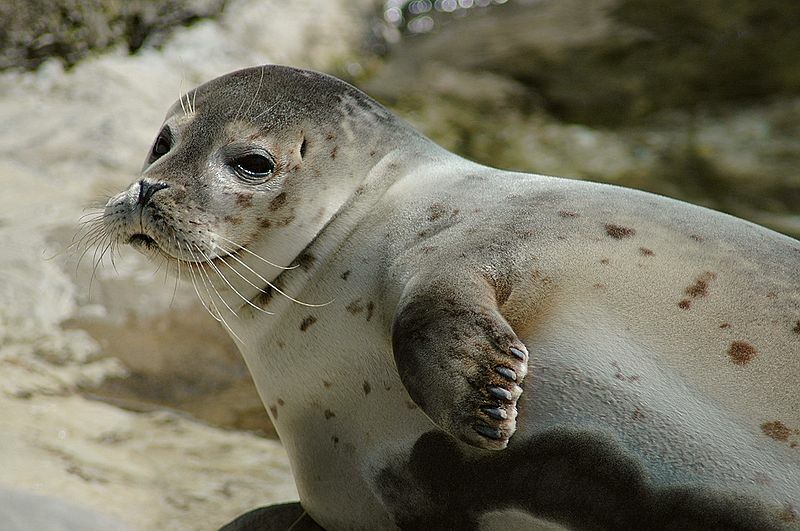 Pacific Harbor Seal in Western North America. Insular Seal in Eastern Asia. Eastern Atlantic Common Seal of Europe and western Asia. They are one of the most common seal in the world. Often seen in Britain off the south eastern coasts. Seal tracks are commonly found on mudflats and on sandy beaches. The current UK populations is estimated to be around 30,000. The best time to see them is when the tide is out. They vary in colour from black, brown, grey or tan with darker patches, underparts are generally lighter. Each pattern is unique to the individual. They have a rounded, spindle-shaped body with a large head with short body and flippers. The nostrils are V-shaped and there is no ear flap. In Britain: Around the coast of Scotland, particularly the Hebrides, Orkney and Shetland, but mainly the east coast of England in the Wash.
Habitat: the waters of the north Atlantic and North Pacific oceans and on rocky outcrops and sandy environments. Food: Fish, molluscs and crustaceans, sandeels etc making short regular dives to less than 100m. Breeding: Courtship and mating takes place underwater. The females mating with the strongest male. Females have 1 pup and are the sole carers, and will mate again after weaning which usually lasts 4-6 weeks. Gestation period 11 months. They give birth in June or July each year. Distribution: Thought to be around 400,000-500,000 individuals in the oceans. Behaviour: Opportunistic feeders. They will inhabit sea water and fresh water, they don't tend to travel far from shore usually not more than 20km, but can spend several days and sea and travel up to 50 km in search of feeding grounds. They haul themselves out onto rocky shores, mud flats and sandy beeches. Their predators are killer whales, polar bears and stellar sea lions, and pups can fall victim to foxes and large birds of prey. Pups can crawl, swim and dive within a few hours of birth. Males will fight for females underwater. They are able to dive for up to 10 minutes and can reach depths of 1500ft, but average dives are for about 3 minutes and 66ft. They do not form large groups but can tolerate individuals within range. They have to spend a great deal of time on shore when moulting, shortly after breeding. Common haul out sites include sand banks, gently shelving rockey, single or sand beaches. Conservation Status: They are not endangered, although in some places their habitats have been and in these cases local populations have disappeared. Their biggest risk is with fishermen feeling their are a threat to their livelihood and becoming tangled in fishing nets and drowning. In the UK, Canada and Norway it is illegal to shoot seals. It is also illegal to commercially hunt common seals.